The Four of Cups represents apathy, boredom, cynicism or being “jaded”. The three upright cups represent the current conditions, or the conditions of the past, which the figure in the card has grown bored of or used to. The fourth cup appears mid-air, offering itself to him like a gift, very much like the Ace of Cups; yet the man either refuses to accept it, or does not even see it. Instead he looks sulky, suspicious and firmly rooted to his seat. This card may indicate a stultifying or stagnant situation which drains you of your enthusiasm and life force; yet rather than turning your sights toward a new opportunity which is beckoning, you are remaining focused on the unpleasantness of your current situation. Perhaps you are so numb from living in the same way for so long that you can’t even appreciate what powers you do have to change your situation, or how easy it would be to improve it. You may even be blase` or cynical about new opportunities, feeling skeptical that anything could truly change, or you may feel bored by everything and incapable of rallying your spirits for anything. At any rate, the card shows that there is some opportunity coming your way, but you are having none of it. This card can signify procrastination, “riding the fence”, being half-in and half-out, apathy, disenchantment and willful or unwillful blindness. It may indicate that the answer to your predicament is “right in front of your face” yet you are not seeing it, either because you are refusing to, because you have not yet thought of it, or because you are close-minded. You may have an emotional barrier to reaching out and grasping this hand which is extending towards you, such as lack of self-esteem or shyness. On the other hand, occasionally we are well-served by being stubborn, and in rare cases this card can mean there is an approaching opportunity which is not yours to accept. The Four of Cups card is connected to the Moon (High Priestess) in Cancer (Chariot). The Four of Cups card can represent a time of contemplation and apathy in your life. You may be feeling unsatisfied in some aspect of your life or not recognizing the things you are being offered. You may feel bored with the things you have, but are not motivated to make any changes in your life at the moment either. 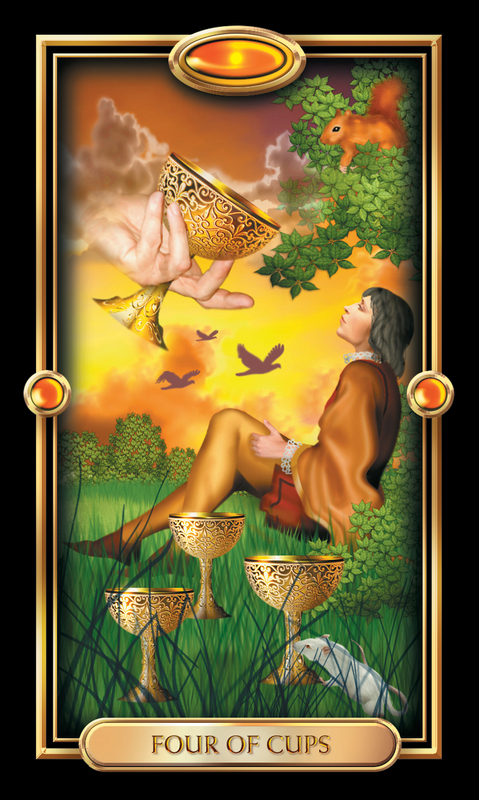 The Four of Cups card may signify gratitude that is needed in your work life. You may not be feeling completely satisfied with your job at the moment, but now is a good time to find balance by being thankful you have a job that provides for your needs. The Four of Cups card may represent the need for reality in your love life. You may be pursuing someone who is not available to you, or you could even be feeling like you are not open to love with someone who is pursuing you. Now is a good time to look at your views on love, and make sure your expectations are realistic. The Four of Cups card can represent a need for you to focus on your strengths while you work on your finances. During this time, you may benefit by focusing on the things you have and the things you have power to do in your financial life. If you are not where you want to be financially, now is a good time to identify where you do want to be and set goals. If you look at your finances squarely and honestly, this will likely expedite your efforts in achieving your financial goals. The Four of Cups card can indicate a need for gratitude and grounding in your spiritual life. If you have been feeling sorry for yourself or wishing things were different in your life, you may benefit from finding yourself in the present moment through gratitude. Now is a great time to shift your focus by keeping a daily gratitude journal or making a list of all the people, things, and situations you are thankful for in your life. Shifting your lens may help elevate your spiritual mindset immensely and quickly.